The new Spark in-ear phones from ID America ($48) come from an increasingly sophisticated evolution of a long line of predecessors. These precision, high-definition earbuds offer a combination of precision acoustics, unique design, and ergonomic enhancements. The dynamic driver and acoustic filter give intense full base with crisp and clear mid-range and treble frequency that will make you want to get up and dance with a big smile on your face. The Sparks are wrapped in high grade aluminum for lightness and solid build, plus the casing reduces vibration and helps to deliver great sound. 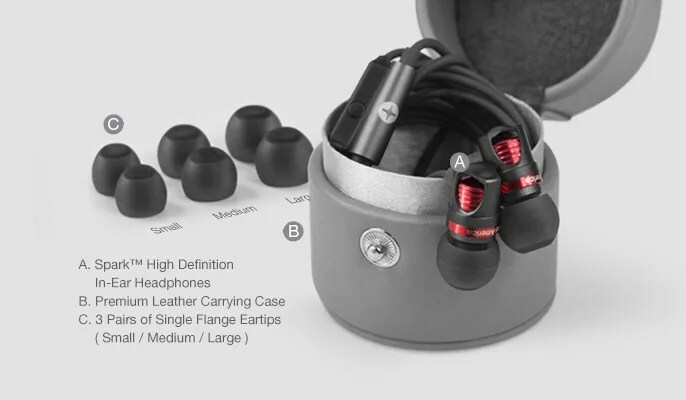 These buds are compatible with iPhone, iPod, iPad, and most other devices with a 3.5 mm jack. But the advanced in-line microphone module works best with iOS products. If connected to an iPhone, the music is interrupted automatically with an incoming call. One click on the inline mic will return to the music. One click will also pause a song or switch to an incoming call. Push the button twice to advance to the next song. Push three times to play the previous tune. These phones are clearly a cut above the ordinary, and you might expect to pay more for them. They come in a handsome leather carrying case with three sets of extra ear pads in various sizes. The price is not that bad at just $48. As you will see on their website, “The UltraSlim is the thinnest leather case ever designed for any mobile device. It is perfect for those who prefer zero bulk.” I can’t sum this review any better than Sena has already said in these two sentences. I can confirm that there is no bulk and no added weight. My 13 year old son even commented the same yesterday when I was bringing my device with us to his dentist appointment. This case is very soft but provides a level of protection for my tablet. The Sena Logo is imprinted on the front and this model (and the Nexus 7 version) also has a built in stylus holder (which also comes with a Sena Pen/Stylus combo. The inside consists of soft velvet, so no scratching. In the beginning the case was a little snug but as I use it more, it’s easier to slide the tablet in and out. I have been using Sena products for years and have been very satisfied with them. This is yet another example of their high quality. I have been very happy with it so far and have found no design imperfections or issues. I am also very satisfied with the level of protection it offers for my needs. If you are looking for a quality basic slip case, I definitely recommend you check this out further.